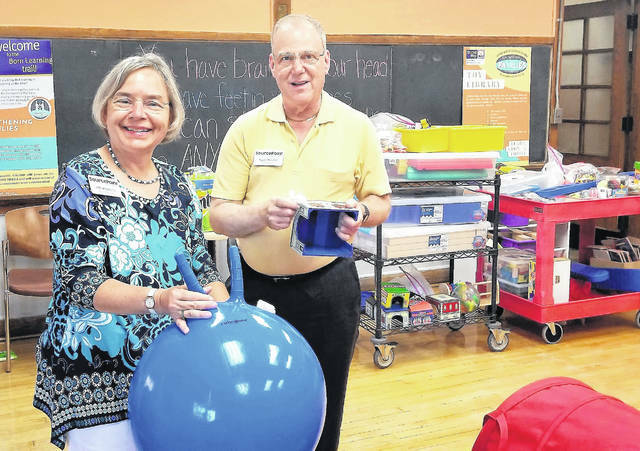 Mary Ann Evans and Nelson Katz were part of a team of 10 sanitizing toys for the Toy Library, among other work. On June 15, SourcePoint staff members formed teams during their annual staff development day to volunteer for community service benefiting five Delaware locations. Three teams assisted the City of Delaware Parks Department with cleanup work at Mingo Park, Veterans Park and Oak Grove Cemetery. Two other teams, one at SourcePoint and one at the Willis Education Center, assembled 155 toiletry kits for the United Way of Delaware County’s Strengthening Families program. The Willis team also sanitized toys and assembled shelving at the Early Childhood Toy Library. More than 65 SourcePoint employees participated in the community projects. SourcePoint is a nonprofit 501(c)(3) organization that provides professional expertise, services, and programs for Delaware County adults who want to thrive after 55. Services and programs are supported in part by the local senior services levy, corporate and private donations, sponsorships, grants, and by the Central Ohio Area Agency on Aging. SourcePoint is a United Way agency. Visit MySourcePoint.org for more information.